Another day, another spectacle in the Ciel lobby. Poor Roman. There are plenty of characters on this show that are miserable 24/7, but Roman has to take the crown as the saddest of them all. He is being manipulated left and right by everyone that he cares about, including Jae-wan and Chairwoman Baek. I don’t think a single thing has gone right for him since he’s been at Ciel. I think we can say for sure that this hotel ruins people’s lives. Get out of there while you still can, Roman! Alas, he’s too busy looking over his shoulder to make sure he doesn’t get backstabbed by either his brother or mother. Yeah, worst family ever. Poor, poor Roman. Overwhelmed by weepy emotions at the discovery that Roman’s actually his long-lost “brother,” Jae-wan drives over to Roman’s place to confirm it. Roman comes running out the door, but instead of greeting his older bro with a hug, he swings back ready to punch Jae-wan in the face. Jae-wan had just finished threatening Roman’s mother, Chairwoman Baek, after all. 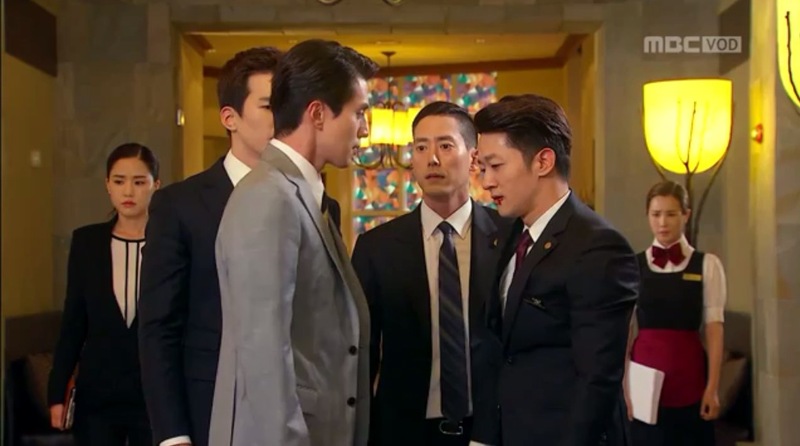 Right as Roman is about to punch him, Jae-wan calls out his real name, “Joo-wan.” This may be the brotherly reunion that both of them had wanted for years, but Roman isn’t quite in a forgiving mood right now. He resents Jae-wan for abandoning him all those years ago, and never even bothered to once look for him. The reunion is cut short when Roman tells Jae-wan to pretend that they don’t know each other. Bros no mo. No hugging it out here. Roman says he wants nothing to do with Jae-wan, but he secretly still does care about his bro. When he runs into an equally sad Chae-kyung, they go to drink their sorrows away together. Roman asks her if Jae-wan’s been happy all these years. Slightly weirded out by the question but too depressed to care, Chae-kyung tells him that Jae-wan had never known happiness until he met Mo-ne. Jeez, that’s pretty grim. She repeats that her newfound mission in life is to hurt Jae-wan for hurting her, but she will still hurt anyone who hurts him. Roman sure looks like he regrets agreeing to drink with Chae-kyung. Chairwoman Baek is still fuming over the failed sell of Ciel’s water park, all thanks to Jae-wan. She uses the traitorous and food poisoning Team Leader Yoo to keep doing her dirty work for her by promising him the General Manager position at a hotel in New York. With his help, she comes up with a list of Ciel employees to fire, specifically the people who are valuable to Jae-wan. On the list is Woo-hyun and Team Leader Cha Soo-ahn. Everyone obviously starts freaking out when they see the list posted on the employee bulletin board, but Jae-wan promises to resolve the matter and that everybody’s jobs are safe. So much drama with that bulletin board. Jae-wan and Mo-ne confront Chairwoman Baek and threaten to call the labor unions on her. Chairwoman Baek laughs in their faces and tells them that she couldn’t care less if that happens. If the labor unions oppose the firings, she’s just going to ignore their demands and let the problems continue to accumulate for Ciel. Mo-ne tells her to fire her instead, and to leave the other employees out of it. Both Chairwoman Baek and I roll our eyes and start laughing at Mo-ne’s arrogance. She isn’t the Chairwoman anymore, and no one is going to care if a maid gets fired. Chairwoman Baek repeats my thoughts exactly to Mo-ne, and tells her that only the useful people to Jae-wan are being fired, so obviously this doesn’t include her because she’s too dumb. Preach it, sister. Jae-wan tells Mo-ne that they will stop Chairwoman Baek by telling all the employees to plead their case to the labor unions, and then file a lawsuit to remove Chairwoman Baek from her position at Ciel. Of course, all the difficult heavy lifting is left to Jae-wan and Mo-ne’s too useless to even gather up the employees herself to tell them the plan, and instead asks Woo-hyun to do it for her. Once the employees were gathered, she repeats Jae-wan’s plan to them and promises to help save their jobs. None of the employees trust or believe in her abilities to help them, since she was the one who allowed Ciel to get taken over in the first place. I guess I’m not the only one who thinks Mo-ne is crazy useless, and needs to stop thinking that she’s the almighty Chairwoman because she ain’t. After finding out that she’s about to get fired, Team Leader Cha receives a call from an old colleague about how Team Leader Yoo’s new GM position at the NY hotel fell through. She then walks in on Team Leader Yoo arguing with Chairwoman Baek on the phone about her going back on her promise to give him the GM position, and Cha Soo-ahn realizes that he’s been working for Chairwoman Baek this whole time. Team Leader Yoo admits to his traitorous ways to her and Jae-wan. Instead of firing him on the spot in his office, Jae-wan waits until they are in the hotel lobby to punch him in the face. That Jae-wan, such a show-off. Jae-wan is rushing off to confront Chairwoman Baek about Team Leader Yoo when he runs into Roman. He tells Roman to side with him because he can’t guarantee that he won’t get hurt when he tries to take down Chairwoman Baek. Roman refuses because he will never go against his mother, the person who saved him. But because he received a phone call from Team Leader Yoo earlier saying that he will take down Chairwoman Baek with him if he goes to jail, Roman agrees to not fire all those Ciel employees if Jae-wan will forget about the Team Leader Yoo situation. Roman just wants some peace and quiet. Chairwoman Baek’s bad day gets even worse when Joong-goo shows up on her doorstep with another copy of the video showing her in Chairman Ah’s office the night of his death. It turns out that the reporter who filmed the original had made a backup copy after all! Joong-goo tells her that Jae-wan successfully convinced Roman into thinking that she did kill Chairman Ah. Chairwoman Baek turns murderous upon hearing that Jae-wan is trying to come between her and her son, and orders a car to run over Jae-wan the next morning in the Ciel parking garage. Woo-hyun is able to push Jae-wan out of the oncoming car’s way just in time, but Chairwoman Baek immediately shows up afterwards and warns Jae-wan to get the hell away from Roman or else. After his near-death experience, Jae-wan goes to Joong-goo’s house and demands to know what his relationship is with Chairwoman Baek. Jae-wan thinks that there must be more than meets the eye if she’s so determined to destroy Ciel. Joong-goo lies and says that there’s nothing more between them. Jae-wan then mentions seeing his mother’s picture the other night when Mo-ne found out from the old man that runs the resort house that the girl in the employee picture Chairman Ah hid away is Baek Mi-yeon. Joong-goo immediately gets nervous that Jae-wan is mentioning his mother and Chairwoman Baek at the same time, and blurts out that Jae-wan should go visit his mother’s grave. Where did Joong-goo find this grave? The next day, Joong-goo takes Jae-wan to his mother’s “grave,” and spins a sob story about how much he loved his mother and had her buried here all those years ago. In the meantime, Mo-ne is cleaning Chairwoman Baek’s office when she decides to snoop around. In the only unlocked desk drawer, Mo-ne finds a picture of Baek Mi-yeon and a baby Hyun-woo aka Jae-wan. She starts recalling all the information Jae-wan told her about his supposedly dead mother, and wonders why Chairwoman Baek would have this picture. Chairwoman Baek walks in her office at this very moment, and snatches the picture out of Mo-ne’s hands. Mo-ne anxiously asks Chairwoman Baek who the people in the picture were, and if that woman was her. Chairwoman Baek neither confirms nor denies being the woman in the picture, and Mo-ne’s eyes practically bug outta her head. Crazy eyes to the max. Mo-ne goes to ask the resort house’s old man about Baek Mi-yeon, since he clearly knew who she was and what happened with her. The old man had previously just said that Baek Mi-yeon was Chairman Ah’s secretary. This time, when Mo-ne demands to know the truth about what happened with her, he tells her that her father and Joong-goo teamed up to ruin Baek Mi-yeon’s life. When Jae-wan arrives at the resort house to tell Mo-ne about visiting his mother’s grave and properly greeting her for the first time, Mo-ne tearfully asks him if he will run away with her. Although she probably doesn’t know that Chairwoman Baek is Baek Mi-yeon, Mo-ne just found out that her father ruined Jae-wan’s mother’s life and probably drove her to her death. That’s going to be one awkward conversation that she has with Jae-wan. Do I need to tell him…? Chairwoman Baek ordered Joong-goo to leave his company house, and even sent in movers to move out his belongings. Roman allows Joong-goo to stay in his house when Joong-goo threatens to reveal to Chairwoman Baek who Jae-wan’s real mother is. When Cha Soo-ahn confronted Team Leader Yoo, he asks her why she’s helping Jae-wan and not hating him instead. Back when they were working in Las Vegas, Jae-wan had convinced Cha Soo-ahn to admit to seducing a superior at the hotel, even though she was the one who was being sexually harassed by the superior. Jae-wan was promoted to GM afterwards, but Cha Soo-ahn’s engagement was ruined because of the incident. She attempted to kill herself, and Jae-wan saved her. Wait…why did Jae-wan make Cha Soo-ahn lie about it in the first place?! When the reporter gave Joong-goo a backup copy of the video of Chairwoman Baek and Chairman Ah, he mentioned that the police can easily identify fabricated videos. Was that video fake to begin with?